We’d love your help. Let us know what’s wrong with this preview of The Titanic would never have sunk if it were made out of a sink. by Jarod Kintz. The Titanic would never have sunk if it were made out of a sink. 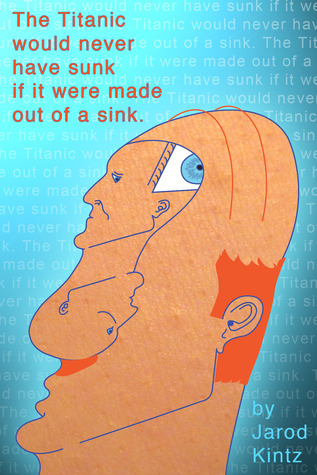 To ask other readers questions about The Titanic would never have sunk if it were made out of a sink., please sign up. Be the first to ask a question about The Titanic would never have sunk if it were made out of a sink. This is it, this is my biography. The story of Jarod Kintz begins now. Let’s knock out the trivial first. I was born in Salt Lake City on March 5th. Now that you know my birthday, please feel free to get me birthday presents. Notice how I used the plural, presents? More than one gift would be greatly appreciated. Appropriate gifts include gold coins, bars of silver, and large tracts of land (prefe This is it, this is my biography. The story of Jarod Kintz begins now. Let’s knock out the trivial first. I was born in Salt Lake City on March 5th. Now that you know my birthday, please feel free to get me birthday presents. Notice how I used the plural, presents? More than one gift would be greatly appreciated. Appropriate gifts include gold coins, bars of silver, and large tracts of land (preferably beachfront property). Or you could just buy me a drink—soda, natural, because I don’t drink either alcohol or high fructose corn syrup. Skipping ahead a few years, and a few hundred miles, we come to Denver, Colorado. For a few years I attended Mackintosh Academy. In the second grade, along with English, I studied French, Spanish, and Japanese. Out of all those language classes, I remember one word: Andrea. That was my girlfriend at the time, the one who left me for my best friend. I guess I remember two words, as I remember his name too, but his name is almost sacred, as a name that shall never be uttered. Right after second grade ended my family moved to Jacksonville, Florida. It was Jacksonville that I would come to know as home, and would attend the rest of my schooling until college. At this point I was a mediocre student. I believe I had a perfect 2.0 grade point average from third grade until I graduated from high school. My favorite classes were art, P.E., and lunch. Oh, is one of those not a class? No way—I believe art is still considered a class. When not cracking jokes in class, I would be doing one of three things: drawing, passing notes, or sleeping. In high school I started to not only be mentally absent from class, but physically gone too. I’d skip class like a flat rock skips across a pond. After high school, it was on to college. In all I have attended six colleges. I bounced around like a dodgeball on a trampoline. If you count the college classes I took starting my junior year of high school, then I got my four-year degree in nine years. And if you’re going to do something, you might as well do it at least twice as well as everybody else—or at least at least twice as long. I graduated with an English degree from the University of Florida, but I took creative writing classes from both UF and Florida State University. All though college I fancied myself a fancy man, because I was an aspiring writer. Mostly I wrote t-shirt slogans and other pithy things. In the spring of 2005 I did manage to sell a line of t-shirts to Urban Outfitters. That is my lone success in life. Seriously. Well, so far anyway. But my story is just beginning. I plan on failing my way to success. I have been rejected by literary agents, publishers, MFA programs, all sorts of women. But still I keep writing. I have written many “books,” and I use the term books loosely. Mostly they are just compilations of my random thoughts and one-liners. But I like writing them, and people seem to like reading them. and that’s what it’s all about, right?